Warning! Not a regular photo booth! Intended for people looking for originality, exclusivity, laughter and (a lot) of laughter! 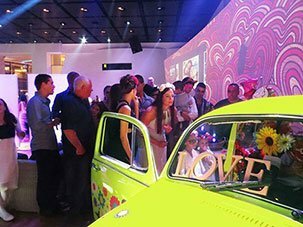 Meet Photomobil the coolest new attraction for your celebration in Israel. 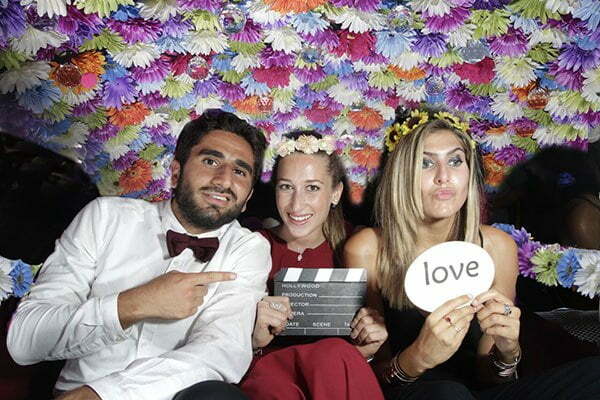 Much more than the standard photo booth for events that you are familiar with. An original photo station built inside a vintage VW Beetle which has been spectacularly designed. Meant for couples who are looking to upgrade their event by several levels above everyone else. The coolest and most original events attraction! 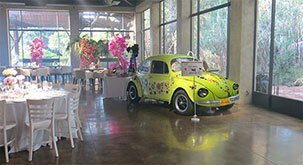 Guests choose their dress up accessories from our wide range, get into the photo booth which is built inside the vintage car, sit down, laugh, click on the touch screen, see themselves again on the screen and fall about laughing again. Then they pose for the camera and have their photos taken. When they’ve finished posing and snapping, they still don’t want to get out of the car because it’s so cool in there! In the end they exit the photo booth whilst still trying to digest the exceptional photographic experience they’ve just had. All that remains for them to do is to collect their picture magnets and take home a comical and personal souvenir from the event. Photomobil’s photo booths add a jaw dropping and unexpected element of surprise for the guests. They are exclusive events attractions that haven’t been seen anywhere else and will upgrade your event by several levels. Our booths are suitable for all types of events: weddings, bar mitzvah’s, bat mitzvahs, company events, promotions, unveilings, private celebrations and birthdays, employee bonding days, company fun days and more. The photo booths can be located outside in event hall gardens and also in closed halls. We arrive with a wide range of really cool props, from little vintage hats with a 1940’s look to moustaches, pipes, cigars, crazy glasses and many more great things that we have collected fromall over the world. Laughter, lots of it, guaranteed! The photo station is opened after the chuppah, or before (it’s up to you) and we carry on photographing for the whole of the wedding. During this time guests can return to have their photos taken as many times as they want, Each guest who is photographed gets a copy of the photo – there’s no limit. Our photo magnets are printed straight after the photos are taken and guests receive them as they exit the car. There’s no wait. There’a choice of sizes: the standard magnet size, a normal photo size, or a retro style triple strip. In short, whatever you fancy! Our photo strip comes in our uniquely designed frame which is a little more special than the regular way which, between us, most people are a bit fed up with. We use the most advanced printing technology and professional photography equipment. Our photo booth produces quality, long lasting and high resolution pictures . Photomobil offers photographs which have been professionally produced and we don’t use an internet camera like the majority of photo booths. We use a the most advanced thermal printer available. In twenty years’ time your photographs will still be perfect! At the end of the event we give you a disc with the pictures from the event for you to keep, and in addition you will receive a digital album with all the photographs. One thing couples arranging their weddings don’t want is an annoying queue for their guests! Who wants to go to a wedding and wait in a long and exhausting queue? Well, that doesn’t happen with us! We go to great efforts to ensure there isn’t a queue. We make sure that any queue moves along quickly and that the guests won’t wait for our photo booth for more than five or six minutes maximum. And you needn’t worry about what your guests will be doing during that time! They will be having fun choosing accessories, taking selfies, deciding what poses they are going to do and…….. in short you really don’t need to worry about them – they won’t be bored! 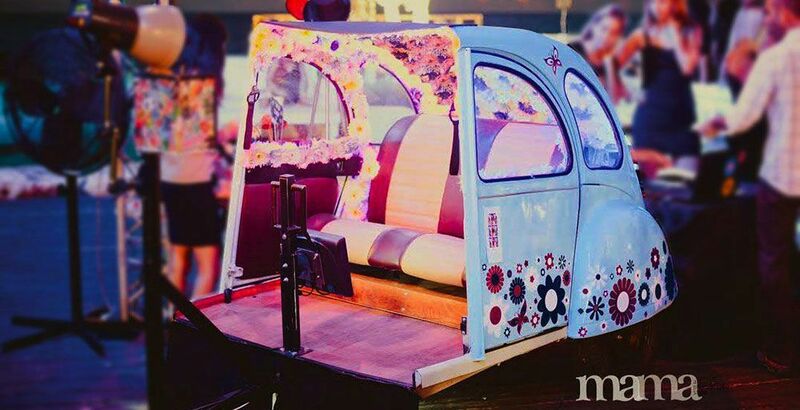 A PHOTO BOOTH IN A HALF CAR! 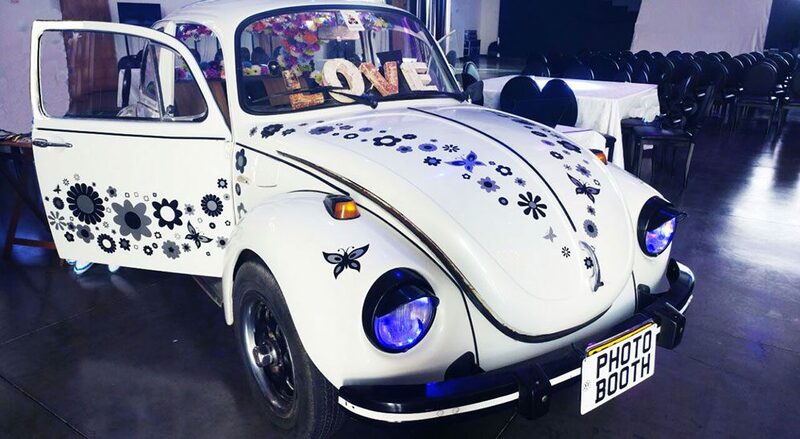 We are happy to be able to offer you not just the photo booth in the VW Beetle in crazy psychedelic colours, but also our latest hot attraction – a photo booth in a half vintage car! Sounds strange? It’s not! This is an attraction which is possibly even more cool and different than our original attraction (the photo booth in the VW Beetle). Our photo booths are unlike any others you may have seen. All our products without exception have been built with great attention to quality and professionalism. WHY CHOOSE A PHOTO BOOTH IN A VINTAGE CAR? The idea for our photo booths was prompted by the demand for refreshing and interesting events attractions. At Photomobil we offer a new, cool and different product which is unlike anything else in the field of photo booths. We promise your guests a unique and exciting photo experience. Our booths add a new light to the field of events and wedding attractions. Without fail our customers tell us that we upgraded their event by several levels and that our service exceeded all their expectations. The price for our photo booths changes according to the location of the event and the number of guests. So don’t be shy – call us and we’d love to talk to you! In addition to the fun experience we bring, at Photomobil our keywords are reliability, quality and professionalism. We offer a friendly and smiling service. Excellent and exact picture quality is guaranteed by the use of the highest quality photography and printing technology.